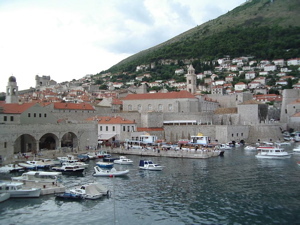 Port of Dubrovnik - Learn how to get from your cruise ship to Dubrovnik attractions and Old Town. As your luxurious cruise ship slowly sails into the Dubrovnik port, you will have a chance to enjoy the view of the lush green landscape around Dubrovnik town and charming traditional grey stone houses on one side. On the other side of the port of Dubrovnik you cannot but notice a relatively new white suspension bridge of Dr. Franjo Tudjman, the first president of Croatia, at the very entrance into Dubrovnik. If you are standing outside on the open deck, take a deep breath, enjoy the seductive smell of clean sea, pine and cypress trees and get ready for an amazing day in beautiful Dubrovnik, Croatia. 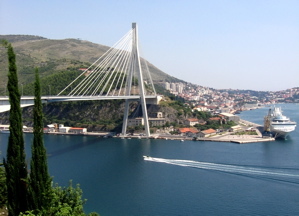 The new, commercial port of Dubrovnik is located in the Gruz neighbourhood. It is about 2,5 km northwest from the Old Town of Dubrovnik, which is where you will want to spend your day. 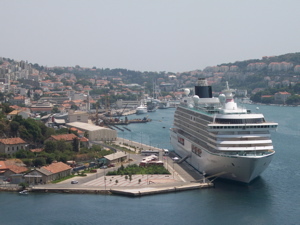 The port of Gruz, and Dubrovnik in general, is one of the busiest cruise ports in Europe. It is not rare that 5-6 ships visit this amazing town in one day and that way create a lot of pressure on the infrastructure of this relatively small town. Actually, the number of cruise ship visitors was getting so high they had to limit the number of ships they can take in a day. So in 2016 they had 529 ship visits and almost 800,000 visitors (less than in 2010) to enter the town through this port. This makes Dubrovnik port third in the Mediterranean and tenth in the world! Also, in 2016 Dubrovnik won the Best Mediterranean Cruise Port Award. But trust us, once you see this beautiful place you won’t mind sharing it with another 10 000 cruisers walking its narrow streets ☺. Actually, to be able to plan your day better, check how many ships you will be sharing this town with on the day of your arrival. Here's the cruise ships arrival schedule. How far is the port of Dubrovnik from the Old Town? We absolutely do not recommend walking as you will spend at least 1 hour trying to get there and all that on your already limited time. Not to mention the heat… you would be tired before even setting foot in the best part of Dubrovnik! 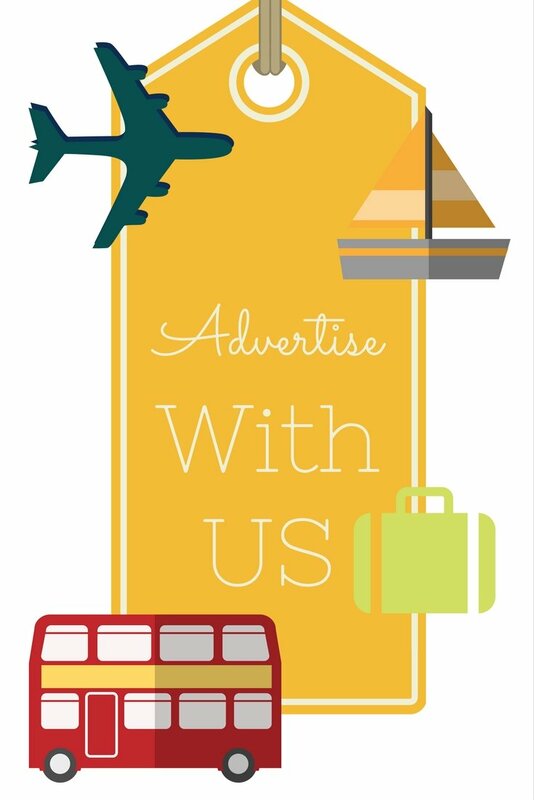 There are a few options when it comes to getting downtown Dubrovnik and you can read more about it here. Port of Dubrovnik is very close to the local bus station, ferry port and there is a big supermarket right next to it, but when it comes to sightseeing there is nothing to see there. The closest ATM machine and money exchange service are at the local bus station, which is just a few steps away from the port. 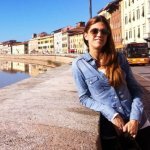 No matter how you decide to get to the Old town, you simply need to get there! This is not the day to save on transportation money. You would deeply regret it! When you return back to the cruise ship terminal you will find some souvenir stalls to browse through in front of the ship. 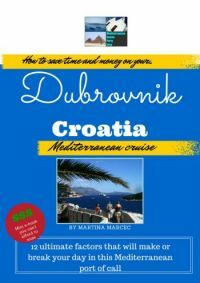 This is just a last minute shopping solution, so make sure you buy your Dubrovnik cruise souvenirs downtown. There, you will find a much larger selection and it will be the only place to get some quality, locally made souvenirs.